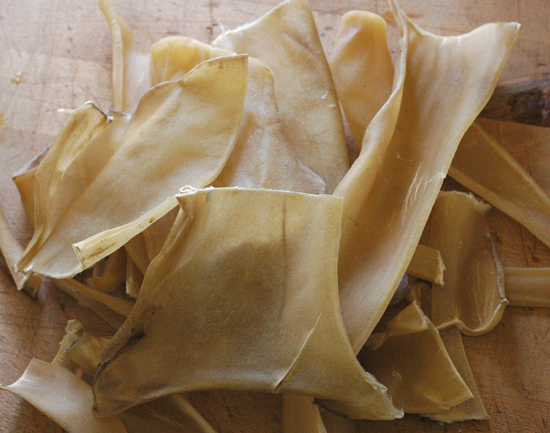 Common materials for glue making are: Skin (including fish skins), fish air bladders, sinew scraps, and antler. (Bone can be used to make a glue, but it is harder to make and inferior to glue from the sources we’ll be talking about.) All share in common a large amount of a protein known as collagen, which is the basis of both leather and glue. 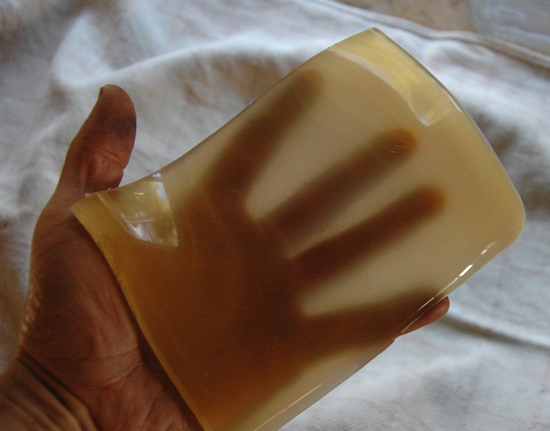 Hide glue is also sometimes known as collagen glue. Skins are generally best soaked in lime or wood ash to dissolve unwanted fats and proteins before thorough de-hairing, fleshing, scraping and repeated rinsing, pretty much as one would in preparation for tanning a skin. 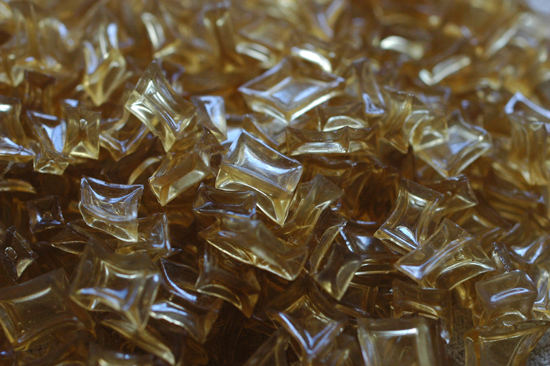 Materials for hide glue are best dried before cooking. This glue stock is carefully prepared bull hide. Before drying, it was limed and then scraped and washed very thoroughly to remove the residual lime and all unwanted material until very little was left except the collagen fiber network that is the basis of both leather and glue. 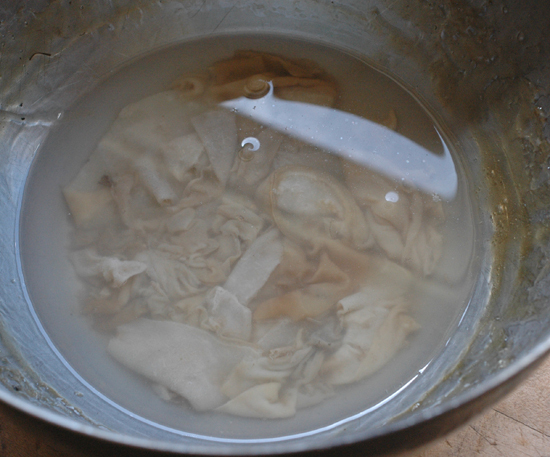 This glue batch was already poured off once and is being re-cooked to extract more of the collagen. In my experience, the second boiling seems a little less cohesive. BTW, this is in a double boiler, which isolates the glue from flame. It works well, but is slower than cooking directly in a pot. When gelled by cooling at room temperature, the gelatin should be easily handled. If it breaks when handled, it is either too wet still, or has poor adhesive power due to use of a poor base material or mishandling at some step. If it sticks easily to dry hands, it is either too warm, or too wet. Evaporate until it is easily handled when gelled. Large sheets of glue are difficult to break up. 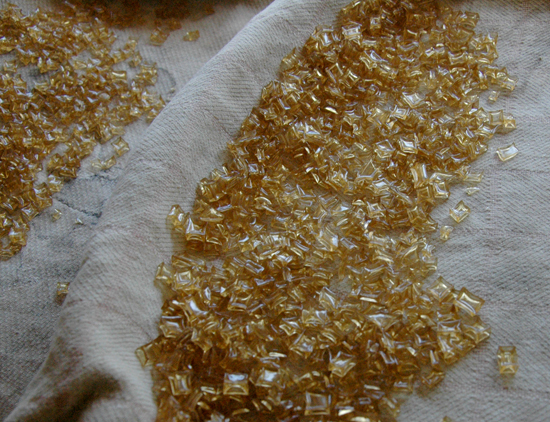 The smaller the pieces, the faster they will soak up when you are preparing the glue for use. Glue can be dried on a clean cloth if it is firm enough not to stick. This glue is almost finished drying. A fan is very helpful when drying glue. Just keep it out of sun and heat or it will melt and you’ll be all like, &%^%$$ ##@$!!! 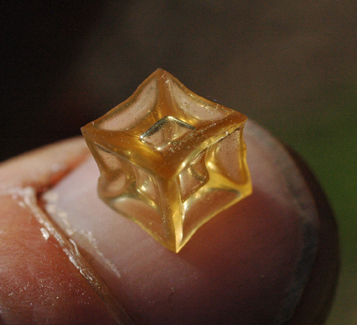 Note the deeply indented centers and sharp edges of these glue pieces, a sign of good quality. What it indicates is that the adhesive power and solidity of the gel was so great that it could be firm enough to handle while still retaining a lot of water. A weaker gel would have fallen to pieces with so much water. This series contains great information as usual. Keep up the amazing work! I usually use hide glue in an outdoor campfire environment while teaching. To facilitate the quick re-melting the glue with a sometimes finicky heat source, I have processed the glue as follows. 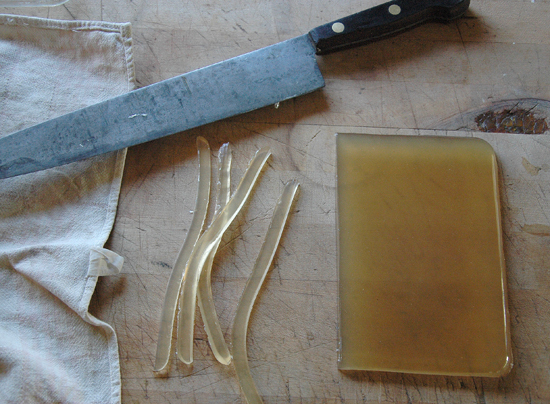 When making a batch of hide glue I pour a thin layer onto a metal pan to cool. Then by gently twisting the pan the glue cracks off and I have a bunch of really fine flakes that will readily turn back into a liquid due to their low individual mass, usually heated up in a large clam shell. I usually start with a small amount and once it is liquid I can slowly add more flakes as they will melt quickly due to the liquid contact area. I usually use the liquid hide glue as a binder for pigments on hide and wood. I learned most of what I know from your classes! Hi Chuck! That’s a cool idea. I’ve done that inadvertently while cooling hide glue in pans and it does dissolve really fast. commercially, they grind it to make it fast to reconstitute, but I’m not sure that’s within my means, though I haven’t given it a good go yet. It does take a really long time to swell all the way if it’s in larger pieces like I usually cut them. I’ll try making a few like that next time I boil a batch. 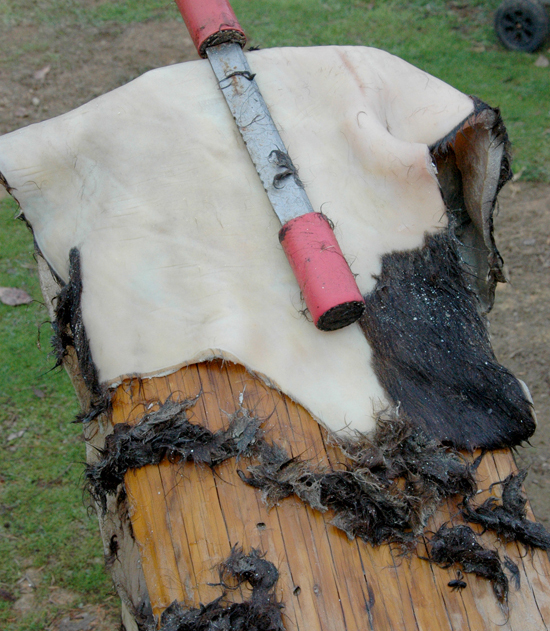 The next time I get a cattle hide, I think I’m going to make a large vat of hide glue. I’m encouraged by the quality of my last batch. Thanks for the praise. You keep up the good work too. I know you’ve reached a lot of people over the years. Hi. That is something I picked up from an old glue making manual, but I also experienced problems using previously frozen material. Interesting that you have used it without apparent problems. Well, I didn’t do any comparison test though.. the glue is exceptional, but I’ll check on my next batch..
By the way, I think this blog and your youtube series is very good and thorough in explaining the hide glue making..
By the way, I think your blog and youtube series is very good and thorough in explaining the hide glue making..